A few weeks I was in Seoul, South Korea! While I did do a lot of shopping (Lord help my bank balance), the goal of the trip was to spend time with loved ones and to recoup. So while we party every day, we also made a point to do some sightseeing. High on the list was the Aquarium. Yeah, the stamps could be for kids only but here I am with a guidebook full of stamps, so who’s the cool one now?! Rather than just a bunch of tanks you look at, the whole aquarium was laid out really beautifully, with each zone having a theme. What I LOVED most about it, was that the fish looked happy. They looked like they had tanks big enough for them, and it seemed like a lot of thought had been put into their environment which has not always been the case for some other animal areas I’ve been too. As there are too too many pictures to go through, not all of them are great and also, aquariums are pretty dark! So rather than go through all 16 sections in detail (argh!!) I’ll just share some of my favourites and talk about the areas I liked the absolute best! It was like a room full of the kind of aquariums you would have in your own home. So rather than being totally awed and amazed, it was just soothing and relaxing. Each tank had a story, this was the famous fish tank, filled with Nemos and Dorys! A fishtank in a phonebox? That’s cool, but what about if we staged a house and put tanks in EVERYTHING?! That’s what this section was all about and it was so COOL! Fish in a refrigerator? Yep! Fish in a bed?! Yep! The coolest was a fish in a harp that played a note when they swam through a string! Piranha are beautiful. They were almost motionless in their tank and shimmered in the low light. It wasn’t until we looked at their teeth that we realised, hey.. these are the terrifying creatures in all the movies! If the fully stamped guidebook hasn’t convinced you already, I am a giant kid! This area was full of fish you could gently pet, an aquarium petting zoo! The emphasis was on gently feeling the textures of the different fish not lots of grabby grabby. These were the most photogenic and the cutest looking of all the pettable ones. Some were outright weird to touch! This is where they come to take pictures that make up the wallpapers. Every tank, every wall was just filled with the most beautifully relaxing fish I have ever seen. Unfortunately my phone camera made the colours seem more washed out, but it was absolutely dazzling. It’s easy to think of the ocean as just blue, but these were radiating vibrant life with ever ripple. This was like a theater. You just sit and watch the sharks swim, it was.. breathtaking. I’m sad that I couldn’t really get any good pictures of this tunnel, they all came out overly washed out in like three shades of blue. Absolutely amazing. You can either walk, or stand on the moving walkway that takes you through slowly. You watch the animals swim all around you, and kind of feel part of their world for a moment. Moon Jellyfish. I could watch them for hours..
None of my pictures capture the absolute beauty of this evening. It was unbelievably amazing, and I wish we had planned our time properly so we could have spent longer, we were there for about an hour just before closing time. Had we checked we probably could have timed it to hit all the feeding times! Though, it was very very quiet when we walked around, so bonus! 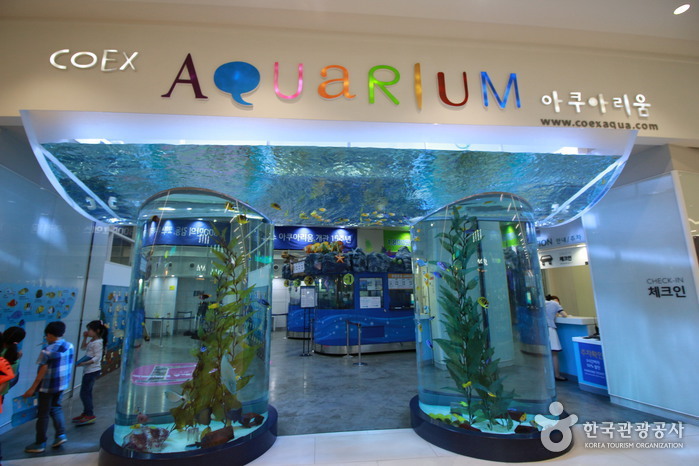 If you’re ever in Seoul, I highly recommend the aquarium! If you want to just observe, then go late at night, if you want to see more of the animals interacting then check out the website for more information on the feeding times. It costs 25,000won per adult and is open 365 days! 10am – 8pm (Last Entry 7pm)! You can comfortably see everything in 1-1.5 hours and while the intro text to an area is translated into English, individual exhibits are mainly all in Korean.